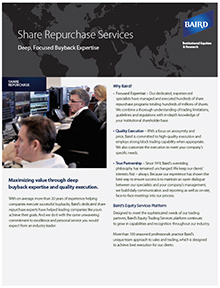 Our dedicated, experienced specialists have managed and executed hundreds of share repurchase programs totaling hundreds of millions of shares. We combine a thorough understanding of trading limitations, guidelines and regulations with in-depth knowledge of the institutional shareholder base. And we execute with a focus on anonymity and price, employing our strong block trading capability when appropriate.